Let’s be honest, the Thor films have sort of been the weak link of the Marvel Cinematic Universe. So obviously they took a cue from the wild success of “Guardians of the Galaxy” and injected a wonderful sense of fun, humor, and retro-coolness into the surprisingly enjoyable third Thor outing. Gone is the fish-out-of-water story that was the basis for the first “Thor” film and so is the convoluted “Portal”-like plot device of “Thor: The Dark World” and we finally get a wild comedic action-adventure that is completely amusing and funny from beginning to end. 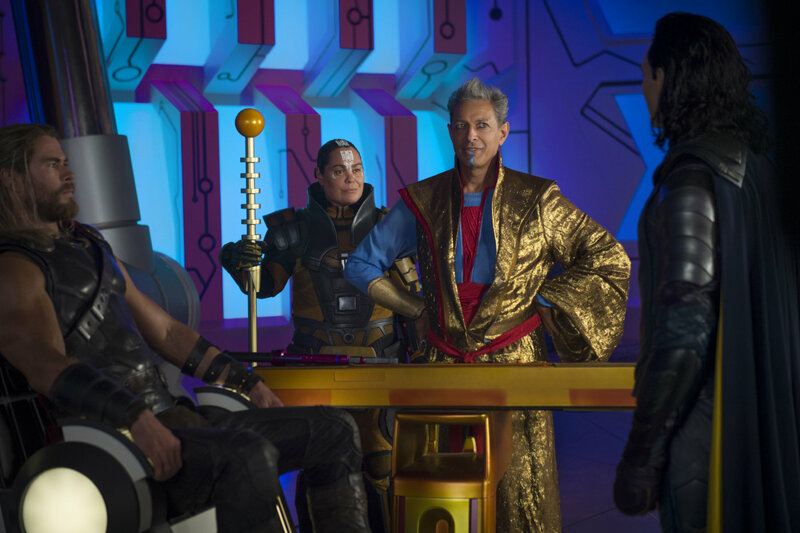 Hot off the silly horror-comedy “What We Do in the Shadows,” director Taika Waititi goes full retro-vibe in “Thor: Ragnarok” which is a welcome change of pace for a series that always took itself a little too seriously; even 17 movies (!) deep into the MCU, the film is fresh, funny, looks cool, and the always charming Chris Hemsworth again proves his comedic ability is impeccable. The last time we saw Thor (Hemsworth) at the conclusion of “Avengers: Age of Ultron” he was leaving Earth in search of Infinity Stones. At the beginning of “Thor: Ragnarok” he’s been captured by a gigantic, fiery demon creature. 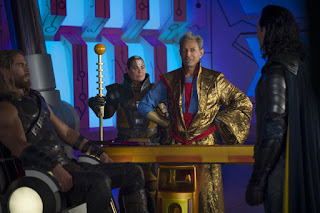 In a perfectly wonderful opening, Thor escapes his clutches while spouting snappy dialogue provided by screenwriters Eric Pearson, Craig Kyle, and Christopher Yost and learns of a prophecy of destruction known as Ragnarok. He returns to his home of Asgard to find a Shakespearean play version of his life unfolding live in front a captivated audience that consists of his father Odin (Anthony Hopkins). Of course it’s really his evil adopted brother Loki (Tom Hiddleston) in disguise. With the help of another Avenger Thor and Loki locate their dying father who tells them about their even more evil sister Hela (Cate Blanchett) who will basically take over Asgard once Odin passes. She does lookin’ like a wicked, futuristic Victoria’s Secret model stag complete with pointy antlers and everything. She destroys Thor’s hammer and he’s whisked away to a colorful foreign planet where he’s imprisoned and forced into a deadly gladiatorial death match with… you know who. Oh and there's Jeff Goldblum at his most Jeff Goldblumy. Oh boy, does anyone really care about the plots of this films? After sixteen of them we just want to see fun action and “Thor: Ragnarok” certainly delivers. The film is a visual treat thanks to Waititi’s flamboyant direction and the humor has thankfully been dialed up. There are some truly inspired bits here that are too good to spoil. Blanchett always makes a fantastic villain, but of course we knew that already. The film’s synth-heavy score by Mark Mothersbaugh completely works with the film’s colorful imagery as do some of the interesting song choices. It’s like an 80s cartoon come gloriously to campy life.